Although I have stopped being a Marxist-socialist by early 90s, somehow I still have some "hang-over" on some Marxist concepts until early 2000s. Here's one such discussion a decade ago, on the relationship between a political party and the state. This is 7 pages long, enjoy. Nonoy, et al, Sometime ago I curiously read an article about certain communist intellectuals (not identified) talking about the time when there will be "separation of Party and state" ... just as the separation of church and state in capitalist countries. They'd mean that the Party would just exert ideological influence and persuasion, not state or police power, to groups of individuals vying for public office over state policies and welfare. If such were to happen and together with a genuine Bill of Rights, such socialist countries like Vietnam and China would not only catch up but even outdistance western countries. By then there would be a global convergence: social democracy (of the east) = democratic capitalism (of the west). State - implements policies of the victorious pol. party. Though often in multi-party countries, the victorious pol. party enters into alliances with other smaller pol. parties to get majority seats in the legislature and to broaden its mass base and support. But in one-party states like China, Vietnam, N. Korea and Cuba, no need for party alliances as the opposition is always weak. So in this definition, party-state separation of function is inherent in multi-party states. Such separation of function is also possible in one-party, communist governments. In slowly-democratizing communist govts. like China and Vietnam, state leaders and bureaucrats are not entirely accountable to their respective communist parties but to the general population, majority of whom are not party members. State leaders are striking a balance between their party (which is generally allergic to drastic reforms) and the general public (who want fast, wide-ranging economic liberalization and political democratization). On social democracy, these are essentially the democratic capitalist states of the west at the moment. Specifically, the welfare states of Scandinavian and Western European countries. These capitalist countries sometimes turn off capitalist enterprises because of the high taxes which their govts. collect to give to the jobless (sometimes encouraging laziness), the sick, to subsidize their farmers, etc. The convergence that you mention is actually happening now: capitalist countries that act like socialist states, and socialist countries that allow predominance of capitalist enterprises. Vietnam is a socialist country, but the streets of Hanoi, Saigon, Hue, etc. are full of tens of thousands of capitalist enterprises. China is a socialist country but Shanghai, Shenzen, even Beijing, are full of capitalist shops and firms. Someday, ideologies will become good academic subjects in the schools worldwide, but they will lose their original spirits. They will soon converge with one basic ingredient that unifies their aspirations: information. Information will uplift world economies, substantially reduce poverty as we know it today. But information will never be made perfect for everyone. Just as the next guy has discovered his neighbor's "trade secrets", this neighbor has already developed a new product or service that is far superior to the one that was discovered by his competitor. Classical Marxism situates the relations between state and party within the framework of socialism as the class rule of the proletariat, and socialism as a transitional phase before society could progress to classless and stateless communism. 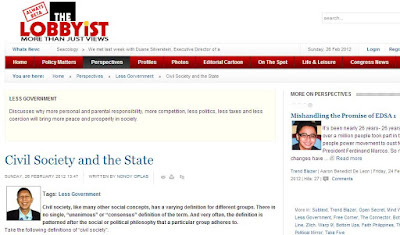 State and party relations also relate to the conept of the "withering away of the state." The classics, in fact, may provide signposts in understanding the remaining socialist experiments. Keeping with my philosophy that healthcare is first and foremost personal and parental/guardian responsibility, not government's, I will post related articles by other authors on how we parents and guardians should take more responsibility in taking care of our kids. I believe that government responsibility in childcare and controlling pediatric diseases is secondary to parental responsibility because the first line of defense towards better health is preventive, not curative. Good nutrition and sanitation, 24/7 watch of babies to prevent injuries, sufficient vaccination, and so on. For children of poorer households, I will grant that there is a role for government, especially in timely vaccination against common pediatric diseases. Below, I am posting two recent papers by a friend, Mr. Reiner Gloor, Executive Director of the Pharmaceutical and Healthcare Association of the Philippines (PHAP), on children's health, treatment and vaccines for known diseases affecting children. Enjoy. Reduction of infant and child mortality is one of the eight Millennium Development Goals that 189 countries, including the Philippines, committed to achieve by year 2015. In 2010, these countries recommitted themselves to accelerate development towards achieving the time-bound targets involving health, poverty, education and gender equality, among others. Significant progress has been made to reach the goal of reducing child mortality by two-thirds in time for the global deadline and the probability of meeting the target is high, according to a report by the National Economic and Development Authority (NEDA). On the other hand, the United Nations Development Program (UNDP) indicated that global child deaths are falling but not quickly enough. The UN agency disclosed that nine million children worldwide still die before they reach their fifth birthday. This signifies that while important milestones have been achieved, efforts must be sustained to meet the goal. The fight against diseases that affect children has been at the center of biopharmaceutical research and development (R&D). Treatment advances have yielded new vaccines and medicines that protect children against many fatal childhood diseases, making pharmaceutical R&D for children one of the key contributors in achieving MDGs. Welfarism need not mean government-sponsored welfare and dole-outs; it can also mean private-funded subsidies, like parents or siblings or relatives to prop up lazy and irresponsible people. When I posted Migration and Freedom 16: Mobility and the Heckscher-Ohlin Theorem in one of my discussion yahoogroups, a friend Floro commented and here are our brief exchanges. Another friend, Jules, also briefly joined. Then another exchange on universal healthcare. This is long, 9 pages including the photos. Floro: Thanks Noy! Paano naman yung mga masisipag kong kamag anak na magsasaka sa probinya? Hindi sila tamad pero low skilled sila kasi di nakapag- aral? Nahahati ng nahahati mga lupa nila bawat henersayon! Pababayaan na lang ba natin silang mamatay? Gusto rin nila mag migrate kahit sa dirty, dangerous and difficult jobs pero maski pamasahe para kumuha ng birth certificate e wala sila. Ano gagawinnatin sa mga taong tulad nila? Paano sila sa mundo ng walang welfare system? Paano sila kung wala ring kwenta ang gobierno ma may Department of Social Welfare? My quickie reply to your questions ha. 1. Hindi sila tamad pero low skilled sila kasi di nakapag- aral? --> May mga alam akong HS or elementary graduate lang, rice farmers din. but they don't spend 100% of their days and time in rice farming. They are also into cattle or pig farming, part-time carpenters, tricycle drivers, during dry season they plant tomato, onions, sitaw (stringbeans), other vegetables. These skills do not require a college degree or even a 2-years voc-tech training. 2. Nahahati ng nahahati mga lupa nila bawat henersayon! Pababayaan na lang ba natin silang mamatay? --> It's expected that their land holding per capita will decline because they have kids. A two hectares land owned by a farmer with five kids is 0.33 hectare per person. When the 5 kids marry and have kids too, the two hectares can be divided by say, 20 people or 0.1 hectare per person. --> Before we can say, "pabayaan ba natin silang mamatay", I think the prior question will be "pabayaan ba nilang mamatay sarili at pamilya nila?" There are many things to do aside from rice farming. In fact, I have NOT seen any rice farmer who only knows rice farming as his sole skill. They are generally mult-skilled people, like the ones I mentioned above. 3. Gusto rin nila mag migrate kahit sa dirty, dangerous and difficult jobs pero maski pamasahe para kumuha ng birth certificate e wala sila. Ano gagawin natin sa mga taong tulad nila? --> No one is stopping anyone from voluntarily helping other people. There are hundreds of charity and voluntary organizations, foundations, NGOs, etc. that are willing to help if the proper information between those who really need help is transmitted to them. --> the NSO and the LCR offices of municipal/city governments should therefore bring down the fee to get a birth certificate. Btway, do you know that in many cities, there are cradle-to-grave fees to pay? Birth certificate fee, residence certificate fee (annual), marriage certificate fee, death certificate fee, burial fee. 4. Paano sila sa mundo ng walang welfare system? Paano sila kung wala ring kwenta ang gobierno ma may Department of Social Welfare? --> Welfare system is mainly given by the households and family/clan. Even lazy and irresponsible people (drink and party as often as they can even if they have no or unstable job) are supported, fully or partially, by some of their family members. --> Government welfare system essentially encouraged irresponsibility. A public education system is supposed to help citizens to become productive and skilled. Thus, it should be one time only, as the adults and parents are supposed to be productive already and should be able to take care of themselves and their households. But this does not happen. Jules: It seems that a welfare state, cradle to grave welfare, works only when only a few people are "on welfare." If they are trainable(willing to learn new skills), imbued with high sense of personally accountability and responsibility, I dont see any reason why they wont find a job. Overated yang college diploma na yan, basta marunong magbasa, magsulat, mag add/subtract/divide/multiply. College graduate nga, hindi naman maasasan at makapgkakatiwalan, panis din! I posted my paper last February 23, Tobacco Tax 5: Consumer Demand After Tax Hike and Smuggling, to some of my discussion yahoogroups, it attracted many good comments and counter-comments. I am posting them below. Get your favorite snacks, this is 11 pages long, cheers. As usual I am amused by the graphical presentations. To begin with, it is quite amazing that anyone has been able to locate the curves at all in the x-y quadrant, when there have been no references made to previous reserach studies, that have computed for the coefficients of the cigarette demand or supply function, say in an urban setting. As you well know, slopes, inflections, and elasticities matter. Without these information, we will not know exactly where final prices and consumption will end up. Even granting the general directional shifts that you posit, without providing the precise location of the starting curves and their elasticities, one could arrive at any set of prices and consumption outcomes, and their ordinal relationships with each other, that would be different from the ones you concluded. First off, there may be more lines in the graphical presentation than is necessary. If we limit movements to sin taxes alone on local cigarette manufactures and legit imports, there would be no reason for the demand curve to shift. One would think that final equilibrium price (and consumption) will just move along the original curve, not necessarily outside of it. Dont you agree? It will be the supply curve shifts that will determine the movement along the demand curve and the final outcomes wrt price and volume. . If this is true, then straightaways we can do away with or remove two cluttering lines from the chart. Secondly, I agree that the supply curve will experience a shift, if the level of sin taxes change. As this will affect the marginal cost of making (legit) cigarettes available to the relevant market. But it will affect only those portions of the supply curve that represent the MC of local 'manufactures' and legit imports. I seem to recall from 101 that the supply curve is the MC envelop curve for all stocks made available to the market (i.e., in this case, local manufactures, legal imports, all the way up to contraband and smuggled). The 'stacking' or consumption order is from cheapest to most expensive. New sin taxes will certainly rearrange the original stacking order. But I doubt that the portion of the curve depicting contraband stuff will necessarily change. We are only sure of is that the final transaction or clearing prices in the relevant market will change. Thirdly and lastly, the critical gap in the graphical presentation is the omission of the externalities ( social or health costs of smoking in a populated setting), which probably would impact the demand curve more since it is actual smoking that 'kills'. Like all pollution issues, this is the toughest nut to crack. But I think that only with these refinements, can discussions on sin taxes become more informative and productive. And that without them, we simply would remain in the dark, if not actually even be misleading. Pardon this humble intervention but it has been a while since I last engaged. The real reason is I finally got a new internet connection with a cheaper provider. More power to you..
My additional points to your comments, Gary. The graph is hypothetical, no assignment of figures and numbers. So P1 can be P5 per pack, or P22.25 or P49.50 or other random or estimated numbers that one can assign from some empirical studies out there. And yes, there can be as many supply curves and demand curves at different micro levels (demand curves by Mr. Smoker A, by Ms. Smoker B, byTherapist Smoker C, by Magician Smoker D, by Smokers ageing 15-19 yrs old, 20-24 yrs old, etc.). Likewise, Smuggler A will have his own supply curve different from the supply curves of Smuggler B, Smuggler C, and so on. But I limited the S and D curves to only 3 each for simplicity purposes. In fact I wrote that paper mainly for the various health NGOs and health professionals as my target audience, as they are the ones who are relatively active in pushing for really high tax rates for tobacco and alcohol products, mainly for public health reason, not so much for public finance. Thus, the need to simplify the graph. It is possible that only the different supply curves will be moving and the demand curve will stay as is, and so the new equilibrium price will just lie along the original curve, I agree. But the probability of the demand curve moving rightwards or leftwards is larger than the probability of it staying in the same place. As Alex Magno wrote, if the tax is hiked from P2.70 to P30 and the retail price will go up to P100 per pack, then one option for him and other smokers is to totally quit smoking and so, DOF will collect not P30 but zero from each smoker who quit. And as I discussed in the paper, another option for smokers is to totally abandon the known brands that were hit by the tax hike and shift to lesser known cigarette brands that pay zero tax because they are entirely smuggled. The smuggler definitely paid bribes to certain government officials to make his smuggling easier, but the upward influence of bribes to the retail price is much lower than the upward tick due to the tax hike if the smuggler was a formal supplier. The proposed larger state intervention via higher tax rate is supposed to address the social externality issue. About 7 of the 10 leading causes of death in this country are smoking related, directly or indirectly. It's good actually that we do not have elaborate and expensive welfare system that gives free hospitalization, free healthcare, etc. to people who abused their body and we ordinary mortals contribute for their healthcare so that they won't meet their creator much earlier than what they really desire. Meanwhile, I am curious of the various simulations and elasticities. the major assumptions by the DOF in coming up with the magic number, P60 billion per year of additional revenue collections; ie, P60 B on top of existing tax collection from tobacco and alcohol products. Did they assume that tobacco smuggling is totally or partially curtailed? I dont want to belabor this issue, but the actions of Alex Magno and his tribe (reacting solely to retail price signals) can very well be accomodated by, and along, one and the same demand curve. There is no real need for that curve to shift just because his group is constricting consumption due to market price changes. .Anyway, I get the drift of your argument and would now want to beg off this interesting debate. It may be well to remember that tax people feel it their duty to continually come up with measures that will keep tax revenue levels from falling, since expenditure levels are not within their immediate sphere of control. Thats within Congress's prerogatives. They know how unpopular that task is. So we can appreciate that they start off with really atorocious tax proposals, which they can then whittle down until it finally meets with public acceptance. You are doing a yeoman's job speaking for consumers. .
Really? You assume that smuggling will ensue when we raise taxes on cigarettes? Even with the rate of tax hikes which brought Alex Magno to such fits of hilarity, cigarette prices domestically will still be much lower than those sold in other countries. When domestic prices are lower than international prices, what is the incentive to smuggle? This is my article for the online magazine today, refreshing the page. 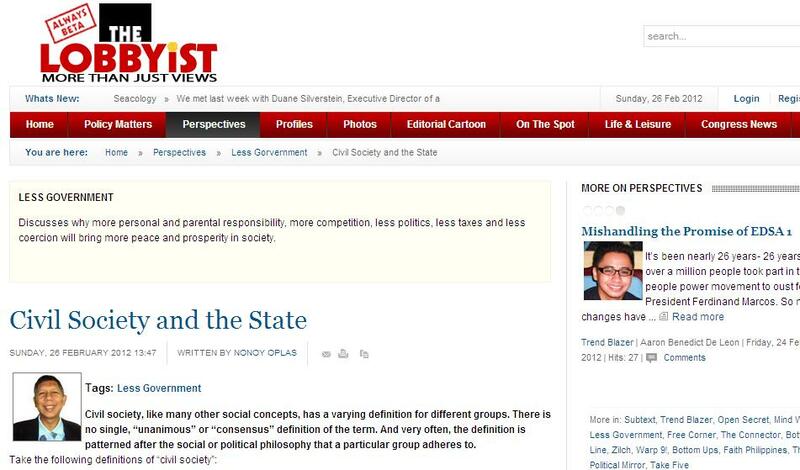 Original title is Civil Society and the State. Civil society, like many other social concepts, has a varying definition for different groups. There is no single, “unanimous” or “consensus” definition of the term. And very often, the definition is patterned after the social or political philosophy that a particular group adheres to. 1. Civil society is an invention to correct state failures and inefficiencies, later lambast market's self-correcting mechanisms (such as de-monopolization of industries through deregulation & more competition). 2. Civil society is a cultural phenomena and has other tasks aside from a mere focus on economics. It does not exist just for the market. To balance out market imperatives is only one of its functions. 3. Civil society role is to encourage and empower individuals and citizens to take on more personal and parental/guardian responsibilities in running their own lives. The principle of subsidiarity says that things that can be done better by the lower level of social organs or entities should not be given to higher social organs, things that can be done by the individual should not be given to the government. 4. Civil society is the arena outside of the family, the state, and the market where people associate to advance common interests. It is sometimes considered to include the family and the private sphere and then referred to as the "third sector" of society, distinct from government and business. Dictionary.com's 21st Century Lexicon defines civil society as 1) the aggregate of non-governmental organizations and institutions that manifest interests and will of citizens or 2) individuals and organizations in a society which are independent of the government. 5. Civil society is as a "third sector," distinct from government and business. In this view, civil society refers essentially to the so-called "intermediary institutions" such as professional associations, religious groups, labor unions, citizen advocacy organizations, that give voice to various sectors of society and enrich public participation in democracies. 6. If all means of decentralisation, deregulation and privatisation have been implemented and citizens have been involved as comprehensively as possible, there is nothing to stop the definitive self-administration of citizens. A civil society has emerged. It is possible to find a hundred (or more?) definitions of civil society, along with their respective role in relation to the government, private enterprises and individuals. I am taking the liberal definition of the term. The 3rd definition above is actually mine. And this clashes with the mainstream or dominant definition, that civil society organizations (CSOs) exist to fill in the gap by government inefficiencies -- note that they do not want to use the term “government failure” while frequently mentioning “market failure” -- in addressing various social and economic problems, from garbage to health to poverty alleviation. In the mainstream definition therefore, there is a close if not symbiotic relationship between government and CSOs. A big and interventionist government is consistent with a big and interventionist civil society community, they often conspire to harass what they think is the source of various social ills – the private enterprises, corporations big and small, businessmen and capitalists. So that in this symbiotic relationship, many CSOs get various contracts and funding from government – local, national and multilateral or foreign aid. But CSOs are supposedly “non-government” groups and organizations; when they get huge funding from government, they become government-funded organizations (GFOs). The Department of Budget and Management (DBM) has released a new regulation, National Budget Circular (NBC) No. 536 dated January 31, 2012 or just two weeks ago. It is called “Guidelines on partnership with civil society organizations and other stakeholders in the preparation of agency budget proposals.” The DBM has created a “CSO Desk” that will monitor the initial 12 departments and 6 government owned and controlled corporations (GOCCs) that will be covered by NBC 536, so that those departments and GOCCs are required to involve CSOs in their budget preparations. I attended the DOH-DBM meeting with CSOs about this circular last February 14, 2012. All CSO leaders and representatives involved in health introduced themselves, their organizations and their specific interests on public health issues. As expected, our group, Minimal Government Thinkers was the odd-man-out because we always link rights with responsibilities, entitlements with obligations, and delineate which healthcare services are personal and parental/guardian responsibility and which ones are government responsibility. I emphasized that people who over-smoke, over-drink, over-eat and over-sit cannot just assert that “health is a right” because they did not recognize that “health is a personal responsibility” too. It was good to see a number of heads among the participants nodding after I spoke. I observed later how some CSO leaders would use the occasion to lobby for more DOH support if not funding for their specific advocacies. And this is part of the process by which NGOs become GFOs. I think the appropriate term for that will be "CSO Insertion" to differentiate it with "Congressional Insertion" and pork barrel in the national budget that many NGO leaders and the public so dislike. Government is very often the arena of irresponsibility and hypocrisy. Of living beyond one’s means, of spending much larger than income and revenue, and resorting to endless borrowings to finance the funding gap, year in and out. The continuing financial turmoil worldwide is very much caused by government fiscal irresponsibility and huge public debts. From north America to Europe to many Asian economies. One can count in his fingers the number of governments that are not heavily indebted, say with public debt of 15 percent of GDP or lower. The bulk of these governments have debt/GDP ratio of 30 to 200 percent, and such ratio is still understated because contingent debts (debts by government corporations and financial institutions guaranteed by the national or central/federal government), as well as local government debts (provinces, states, cities) are often not included. When CSOs become indebted and dependent for funding with government, their capacity to fiscalize and criticize the government for its excesses and wastes becomes limited. This is something that CSOs should try to avoid as much as possible. The debate on raising taxes on tobacco and alcoholic products is heating up again, and this is good because the proposal is targeting two major but separate objectives: improve public finance and public health. I am in favor of raising such tax, but not at very high rates. The main consideration should be finding the optimum, not maximum, tax rate based on multiple goals advanced by the advocates of such proposal. I developed a graph for this argument below. But before my longer discussion, I am posting two reports here. The DOF says government will raise an additional P60 billion in revenues by restructuring the existing excise tax system on cigarettes and tobacco. The agency proposes to raise tax rates on these “sin” products by as much as 1,000%. Socialism and liberalism are political ideologies that are poles apart. The former is advocating more or big government, little or no free market, and state ownership of all means of production, little role for private property ownership. The latter is working on the opposite side, advocating less government and a lean state, free trade and free market, more private property ownership, from personal items to means of production. Many other ideologies fall in between. A few weeks ago, there were many news reports and commentaries about the Presidential Adviser on Political Affairs, Mr. Ronald Llamas, about his big purchase of fake DVDs. A few months before that, his SUV driven by his bodyguards while he was abroad was caught by the police as having long firearms and it created some scandal for Ronald. In the DVD purchase case, the issue was that a high government official is patronizing pirated products when the government is campaigning against piracy and should be protecting intellectual property rights (IPR) like the copyright of movies. I do not want to go into details about those news reports and other commentaries, but I commented on a friend's facebook wall about the issue. My take is not so much about the pirated DVDs and IPR, I've written a lot about that subject, just search "On Intellectual Property Abolition" series in this blog. I share (almost) the same argument and sentiment about the character and politics of Ronald Llamas. I'm, however, saddened and worried about how supposedly critical media outfits, social observers, reformers, and even some in the progressive community have been easily drawn into the anti-reform propaganda and plot created by spin doctors. Hyping up, exaggerating, and spin-doctoring this recent DVD issue and the AK47 incident are obviously orchestrated by anti-reformers whose main objective is to remove Llamas, who is definitely a formidable force in the ongoing process and project for governance reforms and social change. Malaria, dengue, tuberculosis, schistosomiasis, river blindness, leptospirosis, lymphatic filariasis, sexually-transmitted diseases (STDs), these are among the known tropical diseases that affect Filipinos and other people living in the tropics yearly. Many of them are infectious and communicable, usually by mosquitos and other insects, parasites and bacteria, and have no treatment or vaccines yet. Hundreds, if not thousands, are dying in the Philippines alone each year because of these diseases. Yet the attention of many governments and even the WHO are on the lifestyle-related non-communicable diseases (NCDs). Even the DOH website, http://www.doh.gov.ph/ has little discussion about tropical diseases, more on NCDs. While it is true that the latter are now the world's chief killers, their isolation and control are mostly internal, meaning based on personal responsibility or irresponsibility, on how people takes care of their body and that of their households. I have argued in the past that government should focus more on infectious and communicable diseases because these can affect entire communities, and they are relatively easier to control than NCDs. I am posting here two of the most recent articles by Mr. Reiner Gloor on "neglected tropical diseases" (NTDs). Reiner is the Executive Director of the Pharmaceutical and Healthcare Association of the Philippines (PHAP, www.phap.org.ph). This is the organization of mostly innovator pharma companies, enterprises that are often demonized by certain sectors over patents and other intellectual property rights (IPR) issues, and they fail to recognize the value of medicine innovation and the high cost, high risks of such undertaking. These groups are so focused on "cheaper medicines" and curative healthcare, than more powerful, more disease-killer drugs and vaccines. Reiner did not mention the policy bias of governments towards NCDs in his two articles below, I only made that observation myself. Here are the papers, enjoy. THE WORLD Health Organization (WHO) has set a new target that would control, eliminate and eradicate a group of diseases that affects about one billion people living in poor tropical and subtropical countries. By year 2020, the WHO announced its vision to end the misery caused by neglected tropical diseases (NTDs) that kill or disable millions of adult and children worldwide. Since these illnesses affect poor countries, they likewise remain a contributor to a vicious cycle of poverty. NTDs often lead to stigmatization and prevent children from developing to their fullest potential. Given their impact on patients, NTDs can no longer be ignored. Activism means the coming together of a few or even many people for the purpose of changing things in their contexts.... Now, you have a completely new generation of student activists who respond to various issues plaguing this society - which are basically the same from the '70s up to now but with new factors to contend with. Nonoy: Activism is demanding social changes either for the good or for the worse. My activism now is a complete opposite of my activism in my/our younger days. I now call for less government and more personal responsibility in running our own lives. Too much government, too much politics, too much irresponsibility. Him: Hi! Thank you for your contribution in the discussion here. I know that you are one of the more intellectual among people I know back in UP days, so your ideas are very welcome indeed! I don't know why you had a complete reversal (as you said) in your view of activism. Is it because of the experiences of socialist countries that did not work? When I look back, I remember you being so passionate in the past about your views. Whatever it is that made you change your views, I agree with your point here that personal responsibility is an important factor in developing a nation - as can be proven by developed or fast developing countries. Discipline, for instance, cannot be absent in any form of development. People without dreams cannot develop as a group. And yes, too much government is inefficient in most respects. Although, let it be said that this all assumes responsible leadership. Nonoy: Thanks. Just look around: people who don't want to work, or work little and complain a lot; people who work 5-6 days and drink/party 6-7 nights a week, little or zero savings. After over-smoking, over-drinking, over-eating, over-sitting, they become sickly, they demand quality healthcare from the govt, cheaper or free medicines, etc. because "health is a right". For them, "health is not a responsibility", only a right. You don't need to study any political philosophy to see that this is wrong. And big/more government, is precisely fanning this kind of irresponsibility so that govt will tax-tax-tax more, regulate-regulate-regulate more. Dr. Alfredo "Alran" Bengzon at "3/4 of a century old" remains very sharp intellectually. He actually looks like late 60s, he has no white hair, unlike me, maybe he simply dyed it. Wisdom and humility is very obvious in the way he speaks: mild, clear and emphatic at times. I attended a forum yesterday on Access to Medicines: Reminiscing the Past to Pave the Way for Universal Health Care sponsored by the Ayos na Gamot sa Abot-kayang Presyo (AGAP) Coalition held at Sulo Riviera Hotel, Quezon City. 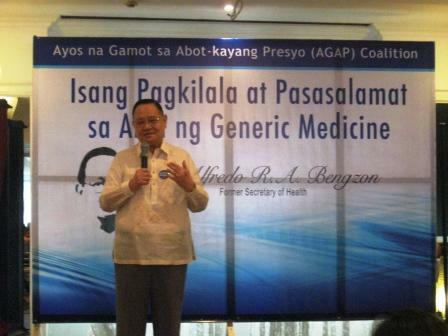 The event was co-sponsored by many other groups like the member-NGOs and POs of AGAP, and RiteMed/United Laboratories (Unilab). 1. Maria Mendoza, Executive Director of the Fair Trade Alliance (FTA), another coalition that is composed also of similar NGOs that belong to AGAP. She gave the Welcome Address. 5. Susan Roces, Ambassadress of RiteMed, a famous actress many years ago (2nd from right). She repeatedly announced "Mag RiteMed na tayo." It was a big advertising for RiteMed/UL in the forum. 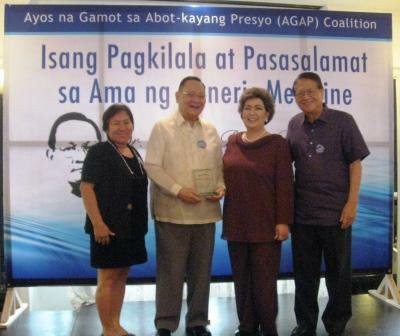 AGAP Convenor and former Senator Bobby Tanada rightmost. The last three speakers gave testimonials on "How generics helped improved their living conditions/access to health". Here's another paper from a cardiologist friend, Doc Tony Leachon. After his article, an article from Inquirer columnist Rina David, where she quoted Tony. According to the World Health Organization (WHO), non-communicable diseases (NCDs) or lifestyle diseases are the leading cause of deaths worldwide. In 2008, of the 57 million deaths, 36 million people died due to NCDs. Deaths were attributed to cardiovascular diseases (48%), cancers (21%), chronic respiratory diseases (12%), and diabetes (3%). 1. Lifestyle - related disease is not a disease of affluence.The WHO Global Status Report (GSR) on NCDs for 2011 revealed that poorer countries are more susceptible to NCDs. High-income countries have 13% prevalence, upper-middle-income countries have 25% prevalence, while lower-middle-income countries like the Philippines have 28% prevalence. Low-income countries have 41% prevalence of premature deaths among citizens below 60 years of age. This is three times higher than the proportion of the high-income countries. Death rates from stroke, heart disease, COPD and cancer) is highest among poorer countries in the ASEAN region (Dans et al , Lancet 2010). One reason for greater death rate in the poor is that the poor smoke much for than the rich. The study likewise shows that smoking rates are highest among the poor in the ASEAN region including the Philippines, Malaysia, Vietnam,Laos, and Myanmar while rich countries like Singapore and Brunei have lower NCD death rate. Prof Antonio Dans of the University of the Philippines College of Medicine said that Southeast Asia is facing the epidemic of chronic non-communicable diseases. Based on 2008 figures, 60% of all deaths in Southeast Asia are attributed to NCDs. Dr. Dans stressed that NCDs are not diseases of affluence but diseases of poverty. In the Philippines, about 200,000 Filipinos die annually because of NCDs. “This is larger than any epidemic we have ever seen in the country,” said Dr. Dans. 2. Traditionally, NCDs are viewed as the diseases of the elderly, “therefore unavoidable.” However, based on studies, NCDs are now affecting even the productive age group from 15 to 59 years old. “Sixty percent of the disability causes in this age group are NCDs. This situation is greatly affecting the productivity and economy of countries,” said Dr. Dans. He further stressed that this figure is projected to increase to 75 % by 2030 if nothing is done. While death or disability results to productivity and income losses, it also brings expenditures for medical care on families affected, leading to serious consequences, not only at the household level, but at the national level as well. 3. Based on National Nutrition and Health Survey ( NNHes) 2008, smoking does not just cause cancer and lung diseases, it is also the number one cause of stroke and heart attack ( 50,000 deaths per year). In fact, smoking causes more stroke and heart attack than diabetes, hypertension , obesity and high cholesterol. 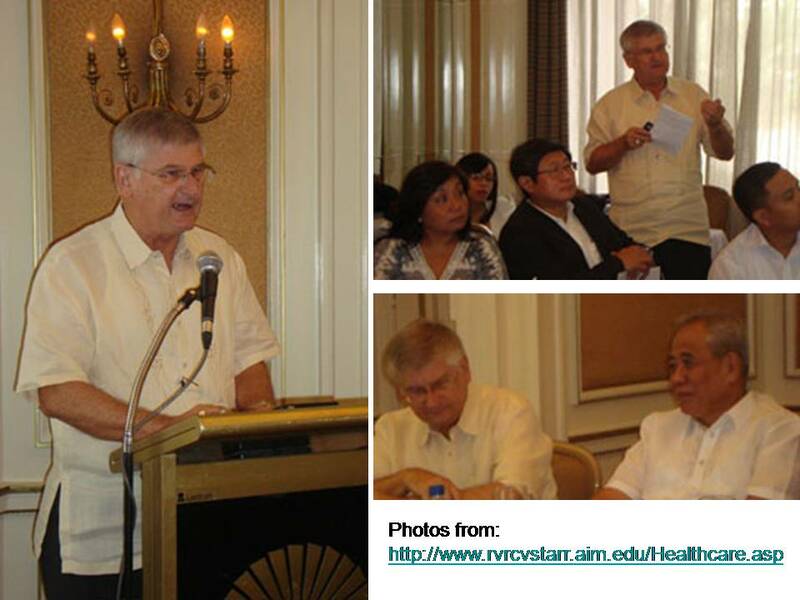 “The prevailing risk factors varied among a country’s income groups,” said Dr. Dans. Physical inactivity among women is the prevailing risk factor in high-income countries, while smoking or tobacco use is the prevailing NCD risk factor among middle-income group countries like the Philippines. 4. We are challenging that lifestyle is a choice. “It is not, because we live according to what the environment provides us.” The medical profession has been unsuccessful in improving lifestyle despite decades of trying. Even medical professionals , with all their knowledge , find it hard to live a healthy lifestyle. Lifestyle is shaped by the environment. If food is expensive , people will eat unhealthy cheap food. If tobacco is cheap, people will smoke. 1. People in the lower socio-economic class have less access to disease prevention. Therefore, they have unhealthy lifestyles and have higher risk factors. 3. Likewise, poor families do not have the money to finance treatments which leads to higher mortality rates. Dr. Dans proposed several measures to promote healthy lifestyle: 1) legislative advocacy on proper food labeling (emphasizing food health risks and benefits), 2) implementation of sin taxes, and 3) legislation on healthy urbanization or creating infrastructure for healthy lifestyle in school, in workplace and the community. Rather than begging individuals to live healthy, we should level-up our agenda towards a healthy environment and help promote healthy lifestyle in our society. We make our goals in life. We define our own successes. We don't get to choose where we start in life ; however, we do get to choose the kind of people we become. While the Department of Health currently operates on an annual budget of P40 billion, the total annual expenditure for smoking-related illnesses (cancers, lung diseases and cardio-vascular complications, not to mention lower productivity, absenteeism and fires caused by cigarettes) total P400 billion. Should Congress pass the “sin taxes” law, which would impose higher taxes on cigarettes, among other things, the government would be able to raise an additional P60 billion in revenues, money which could go a long way towards battling smoking-related ailments. Dr. Tony Leachon, a consultant on non-communicable diseases (NCDs) with the DOH, presents these figures as part of his advocacy to raise awareness about the need to move from a mentality of “treatment and cure” to one of “prevention,” which in the long run is cheaper and more effective.